Finally after many days of adventure and life threatening encounters, the group came to the outskirts of Drellin's Ferry! As they entered town, they were met by armed and alert guards, who informed them that things were not good in Drellin's Ferry, the bustling trading centre had become a hold out against a massive force of goblin tribes who were moving in force and unity from the west, already raiding forces were skirmishing along the edges of town and driving the local farmers into the town. *Beasley and Artemis were keen to see their old friend Kellin Shadowbanks at the Old Bridge Inn, and the group made their way to the busy establishment, however Elyas decided to seek out the Priest at the temple of Pelor. *Kellin was thrilled to see his old friends, but he was struggling to keep up with the patrons of the Old Bridge, which had swelled in numbers due to the blockade to the west and the increased numbers of outlying farmers. *As Rocc and Sardis helped set up the caravan, Faral changed into a dog and went out into the wilds, seeking communion with the woodland spirits. *Smiley and Kwahu made their way down to the Ferry, both with different agenda's, Smiley to buy a chest and Kwahu to seek out the Druid Avanthil, who was rumoured to be in the woods. Smiley found his chest and began filling it with hidden treasures, but Kwahu had less luck finding his Druid, and was informed by a small bird, that Avanthil was not in the grove. The two made their way back to the camp. *Once everyone was back in the camp, word came through that a town meeting was being held in the Old Bridge. Many angry traders and farmers voiced their anger as town councillor Wiston, accompanied by Captain Serena, shared on the peril that threatened their town, their existance and ultimately the whole of the Elsir Vale. 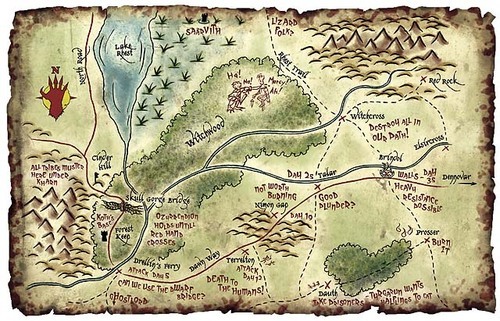 The crowd were told that a large confederacy of goblin tribes from the Wyrmspoke mountains were on the march and Drellin's Ferry was in their path. *The party quickly offered their help and discovered that an old Netharil keep known as Vraath Keep could hold some secrets to the goblin horde, this immediately appealed to Kwahu who had been informed by the "Watchers Eye" that the sacred medicine stick of his tribe, Natchez, lay in an old Netharil Keep just over the great river at the end of the Vale. The group also heard that a large green gem had been taken west by a group of Dwarves, this sounded very much like the heart stone that Faral had been searching for, it was decided unanimously that the group would head to the keep in search of information on the goblins, Natchez, and the heart stone. *They agreed on a reward of 50gp each in the event that they are succesful, after which they retired to the Old Bridge. Hawkday, the 28th of Dehaluyi (Green Moon, Summer 1), 718 N.F. *After a good nights rest the 28th dawned, Hawk day, it was a cloudy day and looked like it might produce a few showers. The heroes from the valley made their way down to the ferry and were met by ferrymaster Drathger, a number of merchants were assembled down by the ferry and were more than pleased to see that finally something was being done to alleviate the problems that had been plagueing them. They had a good hearty chat with Drathger, boarded the ferry and made their way across the river. *After leaving town they journeyed west along the Dawn Way and it wasn't long before the impending wall of the Witchwood arose on the horizon. They entered the eerie woods, and it was Faral who felt most at home, although she had never ventured into this part of the woods. 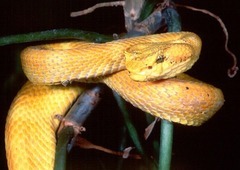 *A couple of hours into their traverse in the woods, Sardis saw a possum and went over to investigate, as he peered into the woods he was suddenly struck on the throat by a very angry little viper, he shook the venomous poison off as if it was nothing and the group attacked the snake, after Rocc's humourous remark to Sardis, "Hey whats the matter, did you get attacked by a little possum!" They all had a laugh at this, including Sardis. After wounding the snake, those in the group who valued nature agreed that it should not be killed, and Kwahu used his bush skills to intimidate the little critter into receding into the safety of the trees. 'Ere the sands of time have shifted. Through Wyrmsmoke they were sifted. The Watcher oft before them. and Marth became their hem. In lands fair and abundant. By their most sacred friend. And now it waits for I. *As they continued on, it approached lunch time and the party reached a floating boardwalk, they saw an upturned wagon in the sodden ground to the side and stood around talking about what they should do. Smiley wanted to investigate the wagon but others were keen to keep moving after becoming aware of some sort of reptillian creature over near the wagon in the marsh. Smiley threw a stick towards the creature and the group prepared to move on. 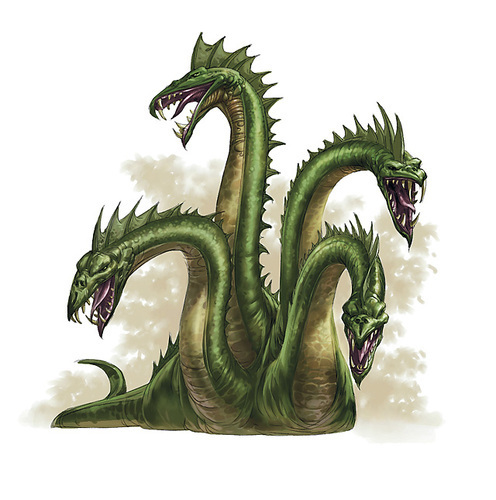 *As they started moving along the path again they were ambushed by a huge, ugly, reptillian monster, which some of the party knew was a hydra. It attacked the party with ferocity and the group responded with some devastating attacks of their own, but no matter how much they battered the creature, it just seemed to keep pressing on. Things looked ugly when Smiley was knocked unconscious and his dog Sunny was killed, but then just as things seemed to be getting desperate for the group, they struck a blow. Anook the spirit-snake, got under the beast's skin, and the big, jolly, Shentulkan spirit, Halitama, engaged in a fierce wrestling match with one of the hydra's heads. They were aided by Rocc and his well-placed crossbow bolts, and Elyas and Sardis blasting away with their magic. Eventually, the monster slithered under the murky water of the swamp and swam away, sorely defeated and almost dead. 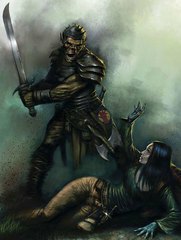 *Smiley went over to the overturned wagon and looted, finding a large suit of red chainmail. Elyas recognised the armor as enchanted Cursebound armor. Such magic armor was relatively common among the ranks of Tiamat followers and the enchanted armor can place a curse upon someone attacking the wearer. Thinking to use Tiamat's own power against her followers, Elyas the champion of Bahamut, decided to put on the armour - a decision that would prove to be costly. *Around mid afternoon the group rested and ate, many caught frogs and roasted them over a fire, whilst Kwahu and Sardis went foraging, the old Shentulkan finding a good feed of berries and nuts. 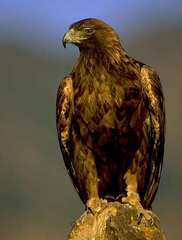 An eagle came and landed above the group, but it was chased away by Smiley, something that Kwahu was not happy about, claiming that it was an evil omen to frighten the eagle away. *Early evening the group approached an old, partially ruined keep on a rise in the forest. Assuming it was the Vaath Keep they were seeking, they investigated and discovered a number of giant skeletons. This had been a battlefield many, many years ago. As they were looking around Rocc and Kwahu heard the sound of goblins talking inside the broken keep. *A plan was devised and Elyas and Kwahu decided to go in, Elyas as an agent of Tiamat, and Kwahu as his prisoner. The rest of the group waited by to ambush the enemy once Kwahu had led them out of the keep. *It seemed that initially their bluff had worked, things were going to plan, Kwahu made a break to run back towards the gate hoping to lead the hobgoblins and the minotaur guards out into the trap, but the pursuit was not continued, the occupants becoming wary, it was at this time that a large manticore arose from behind a wall. Things looked dark for the heroes, the group made their ambush as the pursuers then continued after Kwahu, but it was not as effective as they had planned as Sardis stepped out and revealed himself before the trap could be sprung properly. 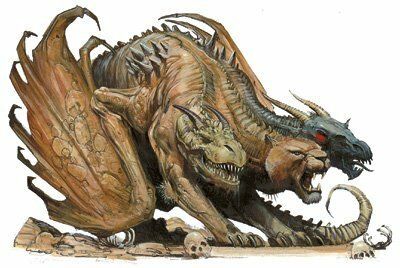 *A massive battle broke out, and it was fairly even, that was until Wyrmlord Koth, an apparent bugbear sorcerer who also knew how to command the up until now docile manticore. At the same time goblin dire-wolf riders broke out of their barracks, this loomed to be a battle the heroes were not destined to win, perhaps it was the armour of Tiamat (as Elyas's powers faltered at a crucial time), or maybe the evil omen of scaring away the eagle, but things went very bad for the group. *Sardis made a break for it, running down the path, making a very tempting target for the Manticore, which skewered him with spikes, killing him. *Kwahu and Smiley made a break for it running out into the forest, they were joined soon after by Rocc, the three of them went seperate ways, fleeing for their lives. Meanwhile in the keep the fate of Elyas and Faral was uncertain, but did not look good. *The three remaining heroes fled into the forest and camped seperately through the night. A few close encounters occured but there was no harm done. Serpentday, the 29th of Dehaluyi (Green Moon, Summer 1), 718 N.F. *Rocc and Smiley met each other in the forest near the raised, wooden causeway and continued on towards Drellin's Ferry, as they approached they saw Kwahu already at the ferry. *The trio caught up on the events of their night alone in the woods and spoke with ferry master Drathgar, before catching the ferry across to the other side, where they encountered Sergeant Hursk. Hursk spoke with the group about the events that had befallen them out at Vraath Keep. The news was grave to the veteran guard and he told the trio that there was a meeting occuring at the Toll House and if they hurried they could make it. They took his advice and went to the Toll House. *It was here that they met what remained of the adventuring group known as The Defenders of the Run: a half-orc monk named Tarak, and a half-Shentulkan ranger named Maharis. They also met a forgeborn dwarf from The West, known as Mim, a battlemind. The two decimated adventuring parties agreed to join forces, and with the inclusion of Mim, The Watchers of the Path were formed. *The newly formed group decided to head straight back to Vraath Keep in the small hope of finding some of their allies alive. Before they left, Kwahu had a strange request to get a squirrel, the group set out to achieve the task and aided by the local youth, Tarak was extremely proud to catch one. After this they went out towards the Witchwood again, on their return to Vraath Keep. *When they were close, Kwahu sent the squirrel towards the Keep, with a message for Elyas, if he was still alive, and they continued on. As they got closer, Smiley discovered two of the hobgoblins from the keep out cooking a lizard like creature! (A longsnout drake native to the forest). The little halfling attacked them, throwing his Mandolin at them! The Watchers quickly joined their little friend, and they killed the hobgoblins, who were joined shortly after by more goblins, which the group happily slaughtered too. *As they approached the keep, the enemies within taunted them, but did not come out, under direct orders from Wyrmlord Koth, the bugbear. However, Kwahu taunted the great Minotaur Karkalan, calling him "Karkalan the Coward", for staying in the keep. The intimidation worked, even though it cost Kwahu some blood and a bruised chest, the great minotaur was out in the open, and the Watchers set upon him in great wrath. Wyrmlord Koth did all he could to get his lieutenant back in the Keep, but it was to no avail, Karkolon was slain outside of the keep, the Watchers managed to secure the surrender of a goblin rider, who they had planned on interrogating, but before they could do that, the Manticore arose from the keep and attacked the party, spurred on by the ferocity of its attack, the goblin defenders raced out and attacked the Watchers in force, driving them back. Poor Rocc was picked up by the great beast and he began to scream, a high pitch ear piercing spear of sound, struggling with his captor, the Gnome managed to wriggle free from its grasp. The group fled, with Mim managing to grab hold of Karkalan's corpse and dragged it back, all the way to the campfire, where they had killed the hobgoblins earlier. *Once back at the campfire, Mim did a strange thing and threw the carcass of the minotaur onto the fire, the flesh began to burn and more than one of the party were repulsed, but Mim knew what he was doing, by sending an enticing aroma into the air, he drew the Manticore out of the keep to feed at the campfire, where the party moved in force and attacked it, causing it considerable damage, it fled back to the safety of the keep before they could kill it. *Following the fleeing beast, the group engaged Wyrmlord Koth and his troops again, another bloody battle was fought, another glorious tale of the Watchers of the Path as they began to gain ascendancy finally in their battle against the lurkers of Vraath Keep. 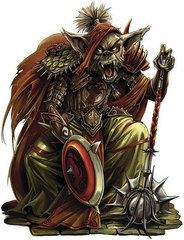 As the battle raged, Wyrmlord Koth dragged out a bedraggled looking Elyas, still alive, but not looking very good, he threatened to kill their friend but did not count on the tenacity of the heroes, as they slew his followers and caused the bugbear to flee, but in a last, fatal move Wyrmlord Koth returned to the keep to get a map he seemed very intense on keeping from the party, but before he could gain the map he was killed, ending the tyranny of Vraag Keep, his manticore mount fled, flying away. 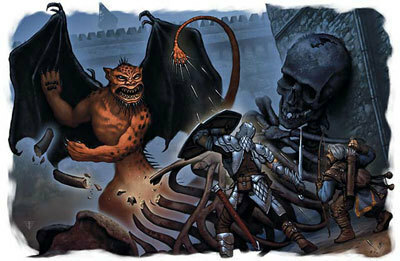 *The group entered the keep, where they discovered the tragic end of Faral's life, by viewing her head on a spike, Smiley made himself busy by killing two little goblin hideaway's, and then by engaging in combat with a devilish little imp, the battle was frustrating Smiley, who couldn't see the little critter, but it was the newly rescued Elyas who saved the day, destroying the devil with a burst of radiant light. 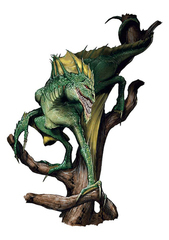 *The Watchers began a search of the keep, Maharis discovered a staff with a green crystal head upon it. Whilst searching, Kwahu recieved a vision from Kabinapak, who told him to find Natchez, the old spirit indicated that the relic was close by, and by the way that Kabinapak looked down, he sensed that it was under them. Tarak looked for a way under the floor and discovered a loose stone that led to a secret ladder straight down. *Meanwhile Kwahu took Faral's head and lit a fire just outside of the keep. While he was stoking it, friends of Mim came and told him how they had escaped the attack of the green dragon, just as Mim had also, Mim was quick to go with them, leaving the party. Kwahu was disturbed in his fire lighting efforts by hearing that the others were going down the ladder, extremely reluctant to climb down the ladder, his fear was overpowered by his desire to find Natchez, and he descended. *Deep down below the keep they found Natchez, and as Kwahu picked up the Wakitan heirloom, he was greeted by many of the great Wakitans of the past, who congratulated him on finding the Medicine Stick, and told him that there was still a remnant of the Wakitans, and that he was not, as he had thought, the last of the tribe. As he took hold of Natchez, an amazing thing happened, his eyes grew back in his head! Besides Natchez, the group also found a large treasure hoarde. *Kwahu returned to his fire, and took Faral's head, burning it into ashes, and then poured the ashes into a brew of herbal tea, and proceeded to drink it, performing a ritual, Faral's spirit appeared briefly and then nodded at Kwahu and vanished. Bisonday, the 30th of Dehaluyi (Green Moon, Summer 1), 718 N.F. *They stayed overnight in the Keep, and then began the journey back to Drellin's Ferry in the morning, as they were travelling, they were ambushed by strange goblin-sized, draconic humanoids riding on drake-like mounts that could leap and run through the trees. The creatures surrounded the group, on the ground and in the trees, Kwahu used Natchez for the very first time, smashing one of the mounts out of a tree, sending both it and its rider plummeting to the forest floor below. The party were very aggressive and took the fight to the critters, but the more they killed the more that seemed to come out of the surrounding trees - including 2 green goblins that fought with kukris. All claimed to be servants of the Red Hand! The battle was not an overly difficult one for the Watchers and they overcame the creatures, driving them back into the woods. *After a few hours journey they arrived yet again back in Drellin's Ferry, once again they dialogued with Drathgar the Ferry master, and as they journeyed across the river Rocc and Smiley performed some tricks for the local kids, who were amazed by the illusions. *After meeting with some of the town councillors, it was decided that they would meet at the Tollhouse. After viewing the map from Vraath Keep, serious discussions were held and plans were formalised, but an ultimate solution wasn't reached, although it was the general consensus that the Watchers seek out and kill the dragon that was responsible for the destruction of Mim's caravan. The meeting was adjourned until the following morning. *That night Kwahu ventured out into the glade on the other side of the Ferry where Avathil resided to seek components for his rituals, meanwhile Smiley went in search of a new weapon and purchased a magic weapon. Stalking Catday, the 31st of Dehaluyi (Green Moon, Summer 1), 718 N.F. *The following morning the group reassembled at the Tollhouse, and it was decided unanimously that the group would source out information on the size of the horde and its current locations - a 'meeting point' for 'the horde' was marked on the map. Whilst they were still discussing this, ironically, a guard burst into the room and shouted out that the town was under attack. The Watchers gathered their gear and raced out to the defense of the town. *A large raiding party of goblinoid invaders were assailing the town. The attackers were split into to main groups. Watchers ran to the defense of the ferry and Captain Soranna led the assault at the stables and behind the halfling inn where many merchants were. (Several merchant guards also joined that fray, led by a large minotaur). 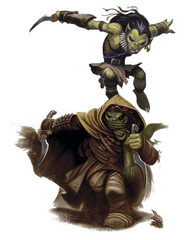 Meanwhile on the dusty street leading down to the ferry the heroes hit the attackers (mostly goblins mounted on red rage drakes) hard at first, with Kwahu's spirits reigning terror upon them. At first it looked as though they would repel them quickly but it soon became apparent that this would not be an easy battle. More and more of the aggressors swarmed into the town, and the Watchers were outnumbered and in dire danger (especially from hobgoblin archers and their spellcasting leader), and one by one they were cut down, until only Kwahu remained standing. He went in search of help and soon sergeant Hursk and some of his men came to assist them. Hursk was killed and his band destroyed, but soon another group of town guards came and the goblinoids were pushed back. A retreat was signalled from the stables and the raiders retreated southwest along the river out of town. The raid had ended, although it had cost the town and the Watchers heavily. *In the aftermath Rocc, Elyas and Maharis were snatched from the jaws of death, but Smiley and Tarak were not so lucky - they perished in the battle along with 9 town guards/militia, 8 caravan guards and 2 townsfolk. It had been a dark day for Drellin's Ferry and for the Watchers. *The assault had been a wake up call to the town that things had to happen, and had to happen fast, another meeting was called and the Watchers made their way back to the Tollhouse. It was decided that they should leave early in the morning, at sunrise and do a reconnasance mission to find out what the enemies strength was and their plans. They were joined in the meeting by a gruff Dwarf named Grom and a powerfully built Minotaur Paladin named Brahams, the two elected to join the party and aid them in their mission. Maharis was left behind as he had not recovered from his injuries. Ravenday, the 32nd of Dehaluyi (Green Moon, Summer 1), 718 N.F. 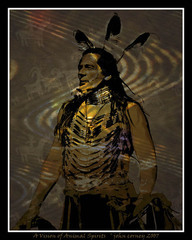 *Raven day dawned and it was a beautiful day. The group wasted no time and departed on sunrise. They travelled back to Vraath Keep but as they approached they could hear the sound of voices, rough grunting voices, though none of them could understand the language. 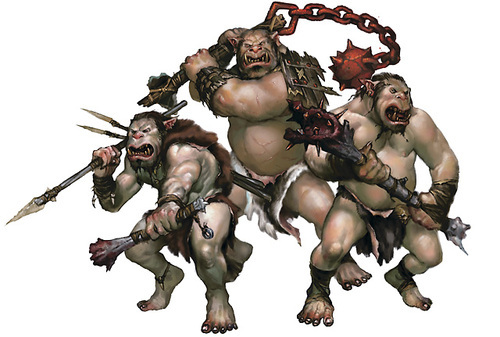 *Grom moved his way down to the keep and discovered that Ogres had taken up residence. His hatred of Ogres got the better of him and he taunted them, causing them to attack him. He relished the fight but was soon smashed down to size. *It appeared as though the Ogres were a father-son duo along with a third one on the wall. Rocc and Brahmas raced in and double-teamed the young Ogre, driving him back into the keep. Rocc and Brahmas were joined soon after by the rest of the party and they pushed the bewildered Ogres further back. *As they pushed the ogres back into the keep Kwahu noticed that the Ogres had defecated on the Red Hand symbol and realised that the ogres also hated the Red Hand. The heroes ceased hostilities and through rough dialogue they discovered that there was a force of Red Hand soldiers further down the Dawn Way. They convinced the Ogres to leave the keep, and moved on further down the road. *Continuing north they reached Skull Gorge Bridge in the late afternoon. 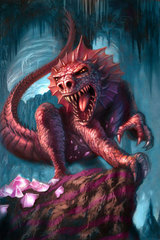 Thebridge was guarded by a band of hobgoblins, a couple of hell hounds and a green dragon. One of the hell hounds moved towards the Watchers' position in the woods. The heroes attacked and the green dragon joined the fray, with hobgoblin archers shooting from the towers. Soon, more hobgoblins crossed the bridge from their tents on the far side of the gorge. The heroes were valiant, killing a number of the hobgoblins and both hell hounds, but the fight was in the Red Hands' favour and the heroes were driven back, suffering some ugly wounds in the process. *As the party moved on down the path, seeking a place where they would be able to rest, and discussing their best options they became aware that Red Hand goblins from the bridge had pursued them, they fired arrows down the path at the party, some of the Watchers charged up the path to meet them, whilst others took to the forest at the edge of the path and moved through the trees. The goblins were no match for them, and they were easily killed, the leader was taken prisoner. He was reluctant to talk when they began to interrogate him, but under some fierce persuasion from Kwahu he realised that it was futile to resist. The Watchers discovered some vital information from the goblin including the fact that there were 5 Wyrmlords, one of whom they had already killed. Azakel was the Overlord, Illway Stormcaller, a female leader, there was Ravek Zhan who is located in a temple deep in the Wyrmspoke mountains where he is believed to be attempting to bring Tiamat into the world. The other remaining Wyrmlord is Zha Vith who resides in the swampy remains of the once great city of Rhest. *After they had exhumed as much information as they could from their captive they rested and it was just on sunset when the green dragon Ozyrandion snuck up upon the camp and snatched Grom, carrying him away in her jaws, back towards the bridge. As Ozyrandion was flying away Maharis came running up to the party and fired an arrow at the beast, hitting it in the soft part of its belly. Bearday, the 1st of Kuyegwona (Ripe Corn Moon, Summer 2), 718 N.F. *They rested peacefully that night and in the morning as they awoke Kwahu was bitten by a huge green spider, the bite was excruciating and despite Rocc's desire to crush the spider, Kwahu ensured that it returned to its forest home. Soon after a squirrel came near the camp and Kwahu was able to prepare a ritual that would enable the squirrel to return to the town and request that they send soldiers out towards the bridge as soon as possible, the squirrel then went on its way to perform its duty. *They travelled back to the bridge with their prisoner in tow and once they reached the outskirts of the forest they planned their attack. Ozyrandion was aware of their presence and toyed with Grom telling him that his friends had arrived just on time. *Brahmas approached the dragon and confronted her on the bridge in what would be remembered for many years as the great confrontation between the servant of Morradin and the spawn of Tiamat, negotiations were ended when Brahmas attacked her. *The rest of the party ran to the aid of the Minotaur and they surrounded the beast, dealing her some major damage, she began to panic as the Watchers took control of the battle, Kwahu got inside her head and she was looking for a way to escape and save her life. In a last ditch effort she lifted herself off the ground and escape looked certain as she took to the skies but a well aimed arrow from Maharis took her in the throat and she crashed to the ground, so close to freedom but not close enough. Ozyrandion was dead. *The group decided to send Grom back to Drellin's Ferry to warn the town and gather some soldiers and Dwarven engineers to help destroy the bridge. After sending him on their way they went across to the goblin camp on the other side of the bridge where the dead dragon lay. Brahmas cut Ozyrandion's head off whilst the others searched through the goblin tents. 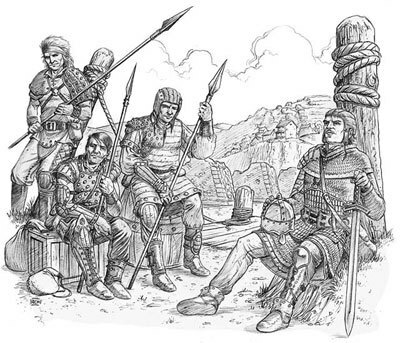 *After finding a few miscellanious items they returned to the bridge and built a wall between the towers at the camp end of the bridge, dragging stones from the area around them and raising it to around 4 feet high. 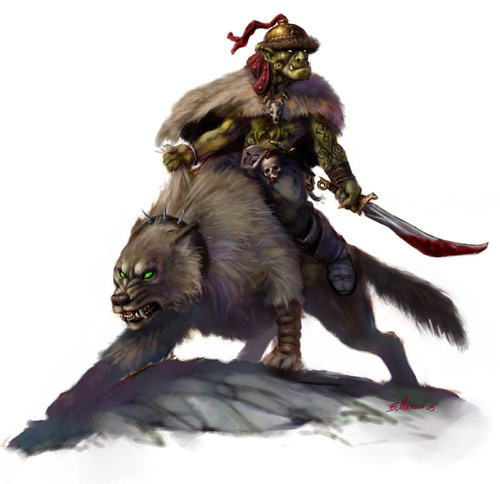 At about that time goblin outriders approached, riding on the backs of Dire Wolves. Rocc and Maharis ran to the goblin camp and retrieved some pitch, so that they could set a fire trap on the wall. The goblins were taken by suprise and some of them fled the scene, whilst others pressed on with the attack. *As the goblins approached, Maharis faced them in the open and boastfully claimed to have killed the dragon - something that sent shivers of fear through the goblins. The battle began and it was a short one. The Watchers sent the goblin wolfriders running, taking one of them prisoner in the process. The information they gathered from him was dire; the horde was planning on marching on the Vale the following day. The horde were going to march over the bridge; the plan become very clear The Watchers had to destroy it. 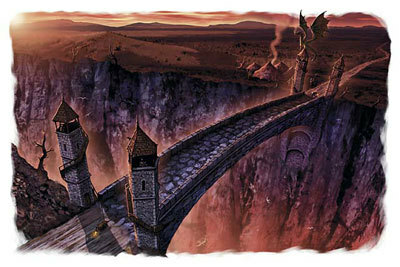 *Brahmas went along inspecting the bridge and found a weak spot near the towers. The heroes wedged boards into the cracks opening them up even further, before spending a number of hours smashing the tower with a warhammer, weakening it until it finally crashed down onto the bridge smashing through it and destroying it. They celebrated briefly before departing to head back to Drellin's Ferry. They had put a major dent in the Red Hand's plans. *Heroes camped in the woods between the Fomorian efigy and Vraath Keep. Drakeday, the 2nd of Kuyegwona (Ripe Corn Moon, Summer 2), 718 N.F. *Early morning, as the heroes made their way back towards the Ferry they heard the treading of many feet and the harsh gutteral sounds of goblinoid voices. 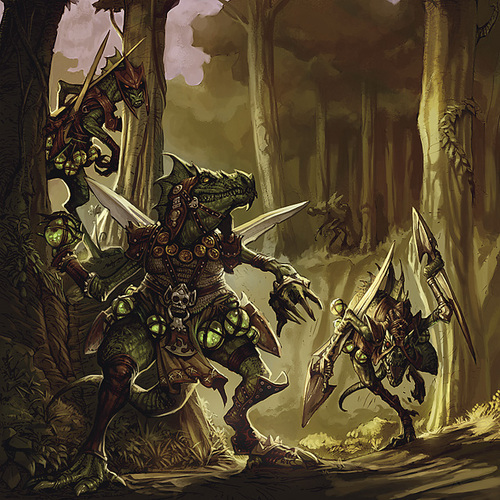 Hiding in the forest they witnessed a whole hobgoblin tribe passing through on their way to joining the horde. They were the Drakescales from the Witchwood forest and had marched along the Old Forest Road. Soon after, the heroes moved on further, past the swamps and encountered Grom and Mim with a group of Dwarven engineers on their way to destroy the bridge. The dwarves joined the Watchers and returned to Drellin's Ferry around midday. *Once they arrived back at the Ferry they were welcomed as heroes. A council meeting was held again and the Watchers persuaded Town Speaker Wiston to evacuate the town. It was agreed that they would have to do it quickly as their enemies were on the march. Residents would have to relocate to Brindoll, the only walled city of the Vale. *As they began to evacuate and gather their things, towards evening, a great three-headed beast flew out of the sky and dived down to attack the town; it was a Chimera. It landed in the center of the town and began attacking the villagers. The Watchers rallied to the defence of the town, along with many of the guards, and surrounded the beast, cutting it down with many well placed blows. As it launched itself to escape it was smashed down and killed, bringing many cheers from the people of Drellin's Ferry. *The town celebrated cheerfully at the demise of the beast as Kwahu took its heart, cut out by Maharis then took it and burnt it, performing a ritual. As he was performing it, a rider came into town claiming that the North Road heading towards Rhest was blocked, the Red Hand had taken it, aid would not be able to be sought from the north until the road was cleared. Thunderlizard day, the 3rd of Kuyegwona (Ripe Corn Moon, Summer 2), 718 N.F. *By sunset the town had evacuated and the Watchers planned to head out at first light.